Sachin is set to be present for Brian Lara Stadium's opening on Saturday amidst controversy over a stand named after the little master. In consultation with Brian Lara himself, The North West Stand of the Stadium was proposed to be named after Sachin, a move which hasn’t sat down well with many in Trinidad and Tobago – where the Stadium is built. Amidst the controversy, Sachin will join dear friend Lara on the opening day of the Stadium. Tendulkar is busy mentoring Mumbai Indians in the ongoing IPL and Darryl Smith sparked confusion that the little master won’t travel for the opening day as he wouldn’t be able to spare time from his busy schedule, much to the disappointment of his fans in the Caribbean. “There were few windows, very, very small windows that we were talking about to get him here but that window was closed because of scheduling conflicts and the show must go on. He may come at some other time, as I said, later on in the year, but at this particular point we don’t want to push back or change the opening date to suit that, so we have to move forward,” Smith had said. Smith heaped praises on the Indian maestro saying that he and Lara enjoyed a great rivalry which prompted them to push each other in quest of being the better batsman. 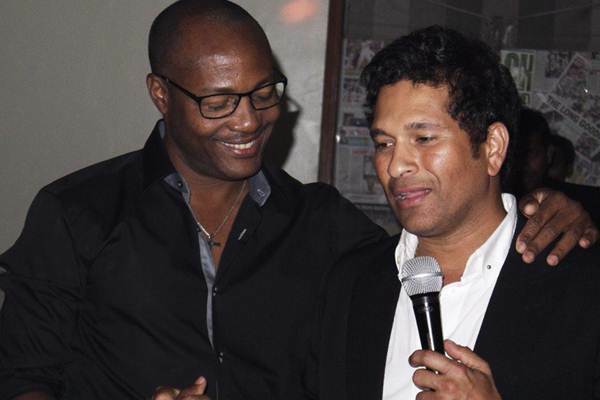 “Of course, Sachin, as he would tell you any day, has been a person who has pulled Lara, throughout his career. In fact, he has mentioned to me several times, Sachin is the reason why there is Brian Lara because they were head-to-head to be the best player in the world. He was pulling Brian, Brain pulling him, for many, many years,” he had said. The biographer of legends like Tendulkar, Lara and Gavaskar – Clifford Narinesingh – in an interview had rubbished the policy of reserving stands for local heroes. He was of the opinion that global stars help make the sport more embracing and people must not have insular views in this regard. He had also mentioned how the Cricket Club of India has a stand named after West Indian great Sir Frank Worell apart from honouring memberships to fellow countrymen Michael Holding and Vivian Richards. “A more global view which transcends the parochial will warmly entertain such a gesture as this can be positive. It can open vistas and make sport more embracing, beyond the limited vision revealed by so many,” he had said. “All I can say at this moment is that an innocent hero has been drawn into a debate, a man whose heart is in West Indian cricket, apart from his home country,” Narinesingh said. All is well that ends well as they say. Millions of fans around the world will be awaiting this encounter where the yesteryear’s legends go head-to-head against each other on Saturday.